Another election season is here with us, and conventionally Ghanaians are faced with the nuance of political party activism aimed at wooing voters to their side. As we draw closer to voting day (December 7, 2016), the intensification of the political campaigns are beginning to have a profound impact on some of our socio-cultural values; much to the concern of the citizenry. For example, some members of respected institutions like the Chieftaincy and the religious, have “defy the odds” to engage in an apparent contest of open campaign or endorsement of one candidate over others; attacks on the integrity and fairness of the Electoral Commission; and predictions of the outcome of the election, all in the name of prophesies, while some politicians and their supporters have also been accused of engaging in acts that threaten national peace such as defacing posters, abuse of incumbency, vote buying, politics of insults, character assassination and deception. This unfortunate occurrence has given rise to diverse perceptions and misconceptions that may be inimical to national cohesion and development. In reaction to this, concerned Ghanaians have added their voice to the call for a decent, clean, transparent and credible electioneering campaign and voting process. The potential consequence of these election related issues has attracted the attention of the Cartoonists Alliance Ghana have made great effort in preaching against these electioneering social ills of the society through the satirical cartoons and interesting animations. foremost animators, Zingaro; in his latest set of illustrations. Cartoonists Alliance Ghana comprise of accomplished animators such as Zingaro, Kofi Quist, Makaveli, Daavi, parables, Nyo and others. In his foray on the issues arising from the 2016 election campaigns, Nyo ironically attempts to bring to the fore, the dilemma of chiefs, caught in the middle of party political chase game of endorsement and open show of support in his illustration titled “Nananom and Politics” (see fig. 1). This is evident in the contemplative expression of the centrally placed male figure with his right hand torching his chin and standing in a dark background surrounded by bags on money held in hand. The costume of the figure: wearing a crown and a kaleidoscopic Akan Kente, reflects his social status as a chief. 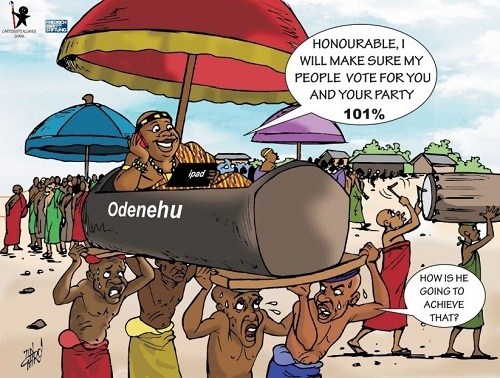 On the other hand, Nyo’s illustrations also reflects a widely held perceptions that, chiefs are financially induced or corrupted to openly endorse or campaign for certain Presidential candidates. 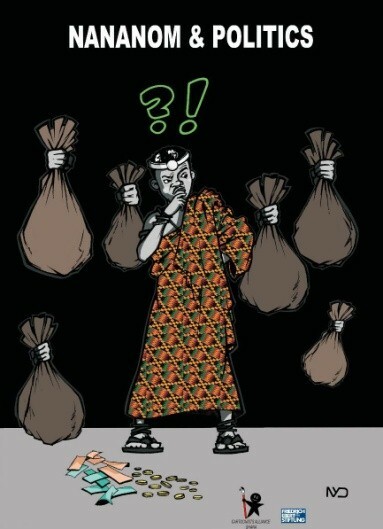 His expression of this concern or perceptions is apparent in the unidentified number of hands holding well packed sacks dominating the dark background, as well as, the green and orange notes and yellow circular shapes representing currency notes and coins on the floors. “Nananom and Partisan Promises” (fig. 2) is an illustration of Zingaro that comically captures the sarcasm of promise made by Chiefs to deliver votes of their chiefdoms to certain candidates; and the discerning power of ordinary citizens. The illustration situates the chief (well fed, content and technologically aware) within a sharply contrasting environment where his subjects appear skinny, frustrated; and physically and emotionally stressed out. This reflects the disconnect between the “political chiefs” and their subjects. Zingaro hubs on this to reveal the increased enlightenments and independence of thought of the citizenry to decide for themselves. He also makes mockery of the “political chiefs”, pointing out the oddity in their promises of votes from their chiefdom. To Zingaro, Chiefs should focus on advocating the needs of their chiefdoms or subjects rather than seeking their self-centered interests. Makaveli, one of the cartoonists takes a jab on the problem of underage voting. He makes a humorous rendition of the problem by emphasizing on the tenderness of the child-voter through their costuming and facial details. To announce his disgust of the child-voter albatross in Ghana’s elections, Makaveli intensified the underage characteristics of his cartoon characters by costuming two of them, centrally placed, in pampers while the other seven on the left are depicted with infantile details (Figure 3). The cartoonists Alliance Ghana continuously preach against the odds in society through the works.